In the 70s it was a typical style of the student movements, in the 90s it was a trend and today it’s in fashion again: knitwear used as a jacket or (more fashionable) as a coat. But it has to be thick, heavy, bulky; it doesn’t have to be cashmere necessarily, there are other extraordinary wools. 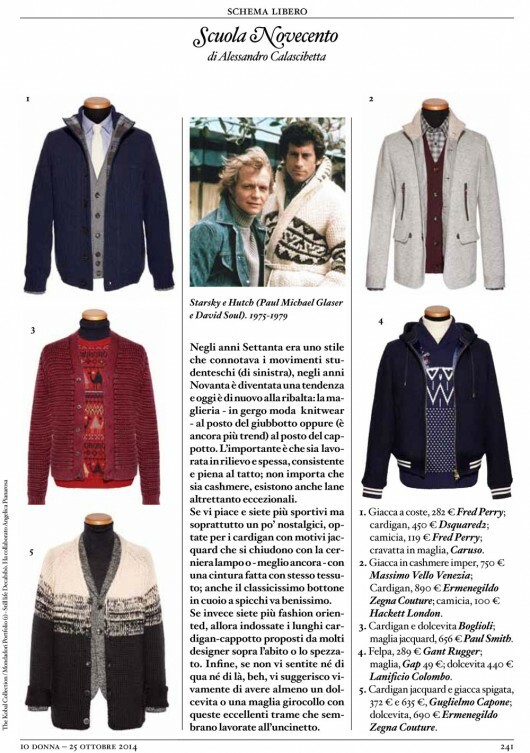 If you like it and if you are sporty and a bit nostalgic, try the cardigans with jacquard motifs, fastened with a zip or – better – with a belt made of the same fabric; the classic leather buttons are ok too. If you are more fashion-oriented, opt for the long cardigan-coats suggested by many designers. Finally, if you are hesitant, well, I suggest you to have at least a turtle neck or a sweater made of these amazing weaves that seem to be made with the crochet hook.